Canada finished the preliminary round in the Bratislava Group with a 2-0-1-0 record. Their only blemish at the annual summer tournament which is held in Slovakia and the Czech Republic was a 4-3 shootout loss to Russia in their opening contest. Team Canada will now face Sweden (3-0-0-0) at 1pm ET in Friday’s semifinal game. The other showdown will feature the Czech Republic (2-0-0-1) against Russia (2-1-0-0). 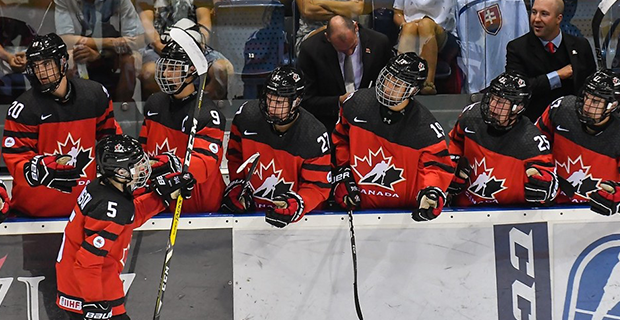 In their final contest of the preliminary round, Canada continued to show their offensive prowess by scoring two goals in each period outshooting their opposition 39-12. Canada’s power play was lethal once again going 4 for 7 with the man advantage. Barret Hayton (Sault Ste. Marie Greyhounds) led the Canadian attack with a 2G-1A, three-point performance. Captain Joe Veleno (Saint John Sea Dogs) chipped in with a goal and assist. Anderson MacDonald (Sherbrooke Phoenix) had a two-point game as well. Other goal scorers for Canada included Calen Addison (Lethbridge Hurricanes) and Gabriel Fortier (Baie-Comeau Drakkar). Goaltender Olivier Rodrique (Drummondville Voltigeurs) stopped 11 of 12 Slovakian shots that were directed his way. Canada finished in second place in the Bratislava Group with 7 points, one behind Russia while Sweden finished atop their division. Team Canada head coach Brent Kisio (Lethbridge Hurricanes) has one day to prepare his team for their meeting against the Swedes. The winner of the Canada-Sweden contest will advance to play in Saturday’s Gold Medal game against either Russia or the Czech Republic. Tournament Notes: On Friday, August 11 Switzerland (0-0-0-3) and Slovakia (0-0-0-3) will play for 7th/8th place while Finland (1-0-0-2) and the United States (1-0-0-1) will decide 5th and 6th place at the tournament. Barrett Hayton finished the preliminary round in fourth place for tournament scoring with 3-3-6 pts. Calen Addison 2-3-5 pts was the ninth best scorer while Joe Veleno rounded out the Top Ten with 1-4-5 pts. Team Canada G Olivier Rodrique played two games and finished with a 1.00 G.A.A. after stopping 24 of 26 shots.